The "Arte di Calimala" — the guild of cloth finishers and merchants in foreign cloth — was one of the greater guilds of Florence, who arrogated to themselves the civic power of the Republic of Florence during the Late Middle Ages. 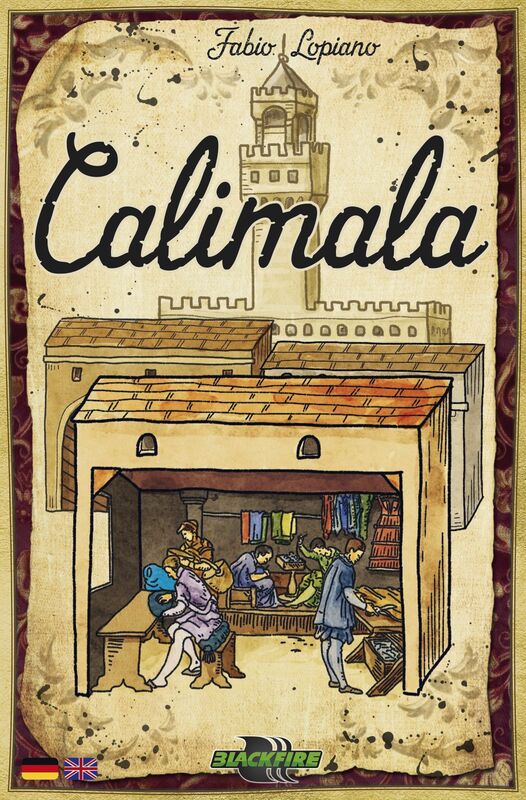 The woolen cloth trade was the engine that drove the city’s economy and the members of the Calimala were the elite of Florence. Throughout its long history, the Arte di Calimala supervised the execution of artistic and architectural works. Most Florentine guilds performed such activities, but the Calimala distinguished itself from other guilds through the number and prestige of the projects and the sites administered, including the construction and decoration of some of the major churches of the city. Depending on the number of players, each player has a number of action discs. In turn order, they can put one on a space between two actions, performing both actions and activating all other discs on the same space. When the fourth disc is placed on an action space, the lowest one is promoted to the city council, which triggers a scoring. After the last action disc is placed or the last scoring phase in the council is triggered, the game ends. The positions of the action spaces and sequence of scoring phases vary from game to game, making each game very different. Secret scoring objectives and action cards add uncertainty. Wenst u het gezelschapsspel "Calimala" aan te kopen?